The Burglary, a comedy by Anthony Winkler, one of Jamaica’s best-loved novelists, is receiving its Canadian premiere in a production attractively designed by Julia Tribe and insightfully directed by ahdri zhina mandiela. 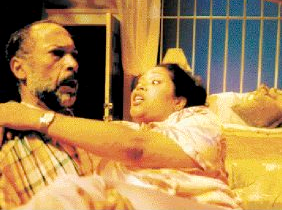 Written in Jamaican dialect spiced with pungent slang, the play is laugh-out-loud funny from beginning to end. After 35 years in the US, Jamaican-born Elbert Hendricks (Paul Anthony) is tired of hearing “twanging” Americans voices and wants to retire to his homeland. To this end he has built a dream home, especially reinforced to thwart break-ins, for his wife Mildred (Kim Roberts). As fate would have it, on their very first night in their new home, they encounter an unusually persistent Thief (Kevin Sinclair). The play begins in the superficial mold of Neil Simon but changes gears when the Thief tells the Hendrickses that what he wants is “everything you have”. From then on the play becomes a fascinating and hilarious battle of wits about such larger issues as who deserves to own such a fine house in such a poor country and what social, political or divine forces have made the Thief what he is. Both Anthony and Roberts deliver richly comic performances. In a truly remarkable portrayal, Sinclair plays the rag-clad Thief as both a mental case and as extremely clever, a man who represents the present-day Jamaica that Elbert had hoped to lock out. The 90-minute show draws you so deeply into the life, language and mores of another country it feels like a refreshing vacation. Note: A version of this review appeared in Eye Weekly 2005-07-21. Photo: Paul Anthony and Kim Roberts. ©2005 .